Audioboom / Fraser Howie on the Chinese economy: They'll have a Lehman moment. Fraser Howie on the Chinese economy: They'll have a Lehman moment. 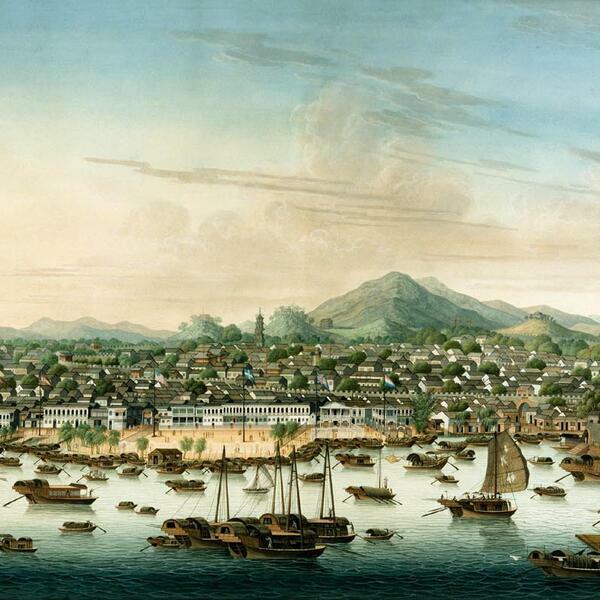 (Photo:English: View of Canton c. 1800. Fraser Howie, author, Red Capitalism: The Fragile Financial Foundations of China's Extraordinary Rise; writes for SCMP, Lowy Institute, et al. ; in re: The game of chicken last week with the Decatur. Has Xi Jinping ceded control of the face of China controlling the world? In some ways, acting predictably; in the case of the Interpol chief, you couldn’t make that up for a novel. Chinese have had it their way for a long time and aren't getting their way any more, and are acting rattled. Their economy has been slowing for a long time; they'll have a Lehman moment. Stress in the economy; have grown addicted to credit. Bloomberg article last week about the big hack, that goes right to the heart of Chinese manufacturing. Struggling, or should be, to find a new model – but they’re so used to running rings around others, esp the US, they’re fighting back in the ways that they do. The very mention of the notion of Hong Kong independence gets Beijing rattled, you have completely intemperate behavior.